The parlor is where families spent time and entertained guests. 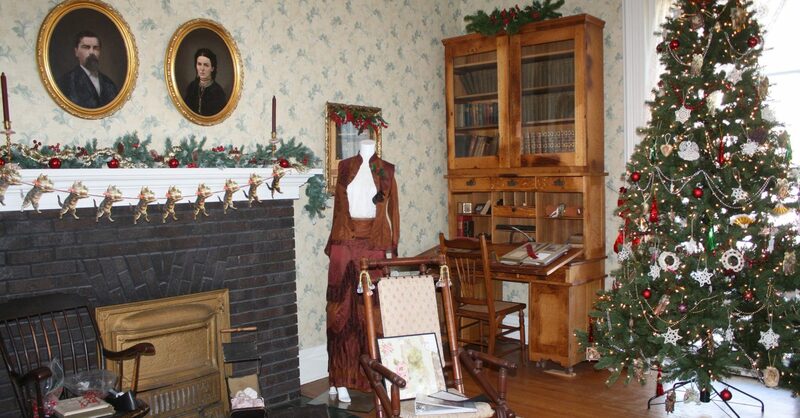 The room features a Victrola from the early 1900’s, a Reed Organ or Pump Organ, and a Piano-Organ. Often these were played by the woman of the house, or children. Thirty families lived at this former residence and they brought their own furniture into the home. When the building was turned over to the Historical Society in 1974, the building was empty. When this room was renovated, six layers of wallpaper were removed and as they were taken down pieces were saved and framed for display. The new wallpaper is a typical style of late 1800s or early 1900s. Through the years many items have been donated to the museum. The parlor is the only room where the original fireplace is intact. On the table are stereoscopes which were a popular form of entertainment from the Civil War era through the Depression.